Railway Group D 62907 Waiting List 2018, Railway Recruitment Board Group D, NTPC For Selected Candidates, RRB Loco Pilot Waiting List 2018, Railway Technician Waiting List 2018. Railway Group D Waiting List 2018:- Railway will now make waiting list of selected candidates who will pass in recent exam of Railway Recruitment Board. Indian Railway Board is already in headache to conduct the examination of RRB in the month of Loco Pilot Technician August and Group D in September. 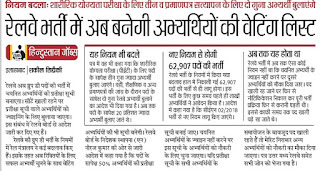 More than 3 Crore applicant will sit in both ALP/Tech exam of Railway as well as Group D. But the major problem is now become selection process. How railway handle Physical, Medical, Joining and document verification. Railway Waiting List 2018 After filling 1 Lakh 70,000 posts Railway Still face lack of employee due to Retirement, backlog vacancies and Promotion seats. Railway Recruitment plays the special role and also re write offer letter to its department employee to join some important posts every month, week or yearly. But New situation like Tree without fruit comes when many candidates join other sector the resulted in to backlog vacancies. Every year Railway retired employee crosses to 20,000. 1. In Railway Ministry has changed many rules and Regulation. 2. Safal Candidates will be called every year according to posts in waiting list. 3. 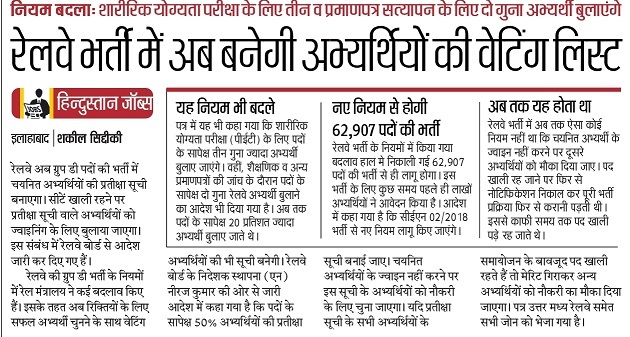 According to order from ministry Railway board Nideshak said 50% High merit gotted in qualified exam will be called when posts need to be filled. 4. Merit List will be also decreased when Railway unable to fill posts. Railway Backlog Vacancies: - If candidates don’t join in Railway department other candidates will be information letter to attend the posts.